A period of horrendous wind and rain saw coverage limited and the coastal areas of the island battered. The 25th wasn't as bad but the prevailing 40mph westerlies and driving rain from the 26th onwards left us all wishing for better weather! 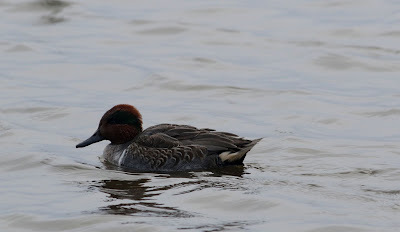 The wildfowl wasn't all too bothered by the wet weather, with 154 Wigeon, 8 Gadwall, 40 Mallard, 3 Pintail, 1 Goldeneye, 9 Tufted Duck, 2 Long-tailed Duck and 1 Red-breasted Merganser were all recorded across the period, the Green-winged Teal was still present on Gretchen and a 1st Winter Female Scaup was present on the 25th onwards on Ancum Loch. A influx of Whooper Swans started on the 28th with 76 being recorded, most of them on Ancum, another surprise came in the shape of a Slavonian Grebe on the 28th at Westness. 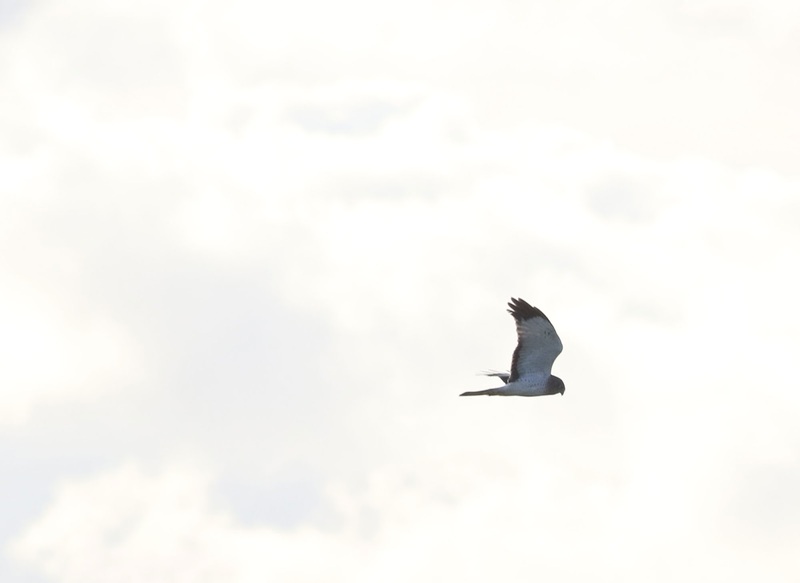 The Northern Harrier is still around and was seen on most days, as was a ringtail Hen Harrier. 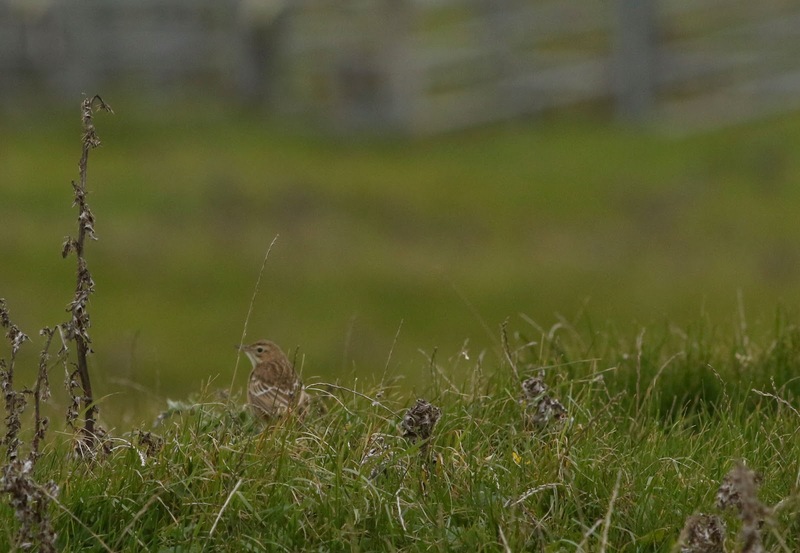 The Skylark numbers have started to settle down with 106 on the 25th, 93 on the 26th, 21 on the 27th. 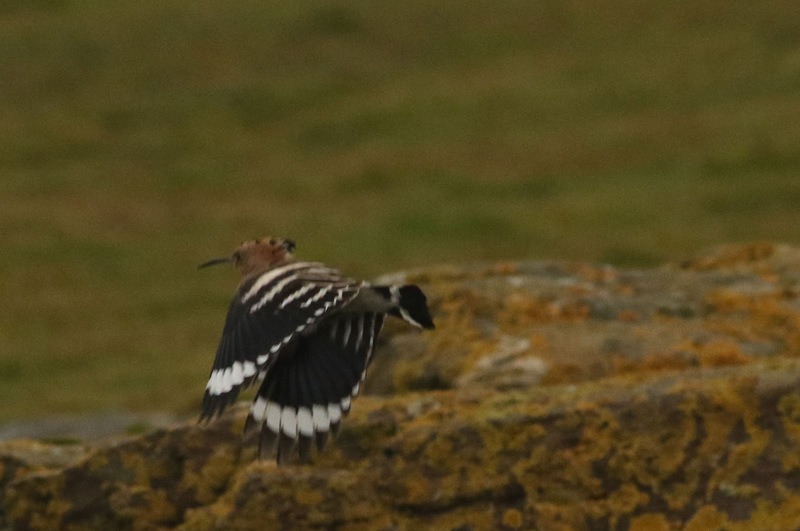 Wader numbers are starting to build further 71 Sanderling, 2 Grey Plover, 5 Woodcock and a Jack Snipe were all present as was the long staying Hoopoe, now feeding by Howar. The prescence of Waxwings is always something to be looked forward too and a single bird on the 25th was much appriciated (there were also 2 that got left out of the previous post!). 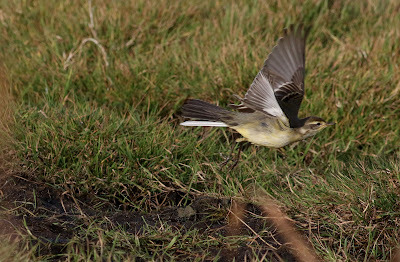 Passerine numbers have started to dwindle as have the Thrush numbers, another late Garden Warbler was at the obs, 15 Blackcap, 18 Chiffchaff, 10 Chaffinch, 24 Twite, 5 Redpoll and 17 Snow Bunting were the passerine highlights, Thrush numbers were as I said, considerably lower, 46 Blackbirds, 36 Fieldfare, 15 Song Thrushes, 185 Redwing and 2 Mistle Thrush were the high counts. It's been a very good couple of days on here, we've had a couple of big rares, and quite a few scarcities as well! The Whooper Swan is still hanging aroung as are the now 8 Tundra Bean Geese, on has since succumbed to what we assume is a bird of prey of kind, however the number went to 9 on the 24th when another single bird was spotted at Kirbest. Six Pink-footed Geese were also present on the 24th, other interesting wildfowl consisted of 3 Goldeneye, 11 Long-tailed Ducks, 2 Pintail and a surprise drake Green-winged Teal on Gretchen on the 23rd. The Fulmars have started to return and the highest total so far was posted on the 24th with 216 birds being counted in coastal areas. Also on the coast 13 Red-throated Diver and 5 Great-Northern Divers were counted on the 23rd. 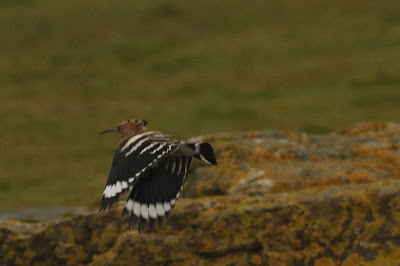 Single Woodcock were present on both days, as was the long staying Hoopoe on the 23rd the bird was at Howar and finally the bird was trapped in Holland on the 24th. 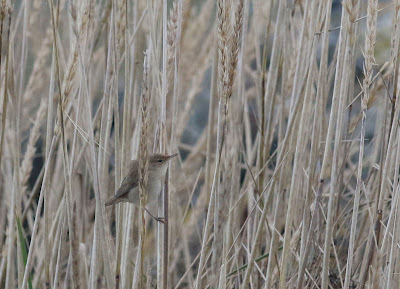 A bit of surprise was a yet to be identified Phyllosc at Kirbest, the bird was initially identified by all watchers as a Radde's Warbler, the bird showed all features in the field that pointed to it's identification, however, on review of photographs there has been dispute into identity of the bird, our feeling is to go with the in-field views of the bird, as we all know what effects photo artifact can have on birds in unfavourable light, for this reason we'll keep all photo's under wraps and allow the governing bodies to decide the birds fate. 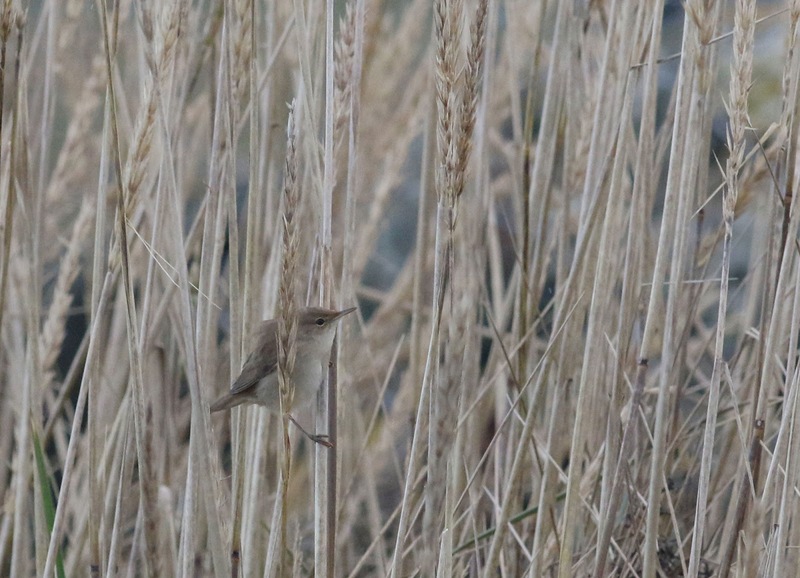 Other passerine numbers were a single Dunnock, 40 Robin, 19 Blackcap, 17 Chiffchaff, 9 Goldcrest, 8 Chaffinch, 4 Brambling, 1 Greenfinch, 2 Yellowhammer, 1 Snow Bunting and a very late Reed Warbler on the 24th. Onto another surprise, one that none of us were expecting, I'll move into first person so I can tell the story! 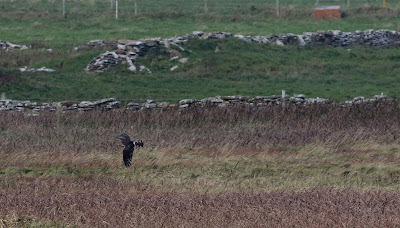 After watching the Phyllosc at Kirbest and returning to the obs I was in (of all places) the toilet, I could see what appeared to be a Harrier out the window, on first glance I though it was a male Hen Harrier, knowing that Alistair had wanted to see one, I alerted him to the bird and we went out and looked at what I thought was going to be a Hen Harrier......how wrong I was!! I lifted my bins and almost dropped them in amazment, it was a Northern Harrier, I picked up the camera and fired off some photos. It was clear to see in the pictures it was a Male Northern Harrier, showing its dark hood, black tipped seconaries and the flecking on the flanks. The assumption is it's last years bird returning. 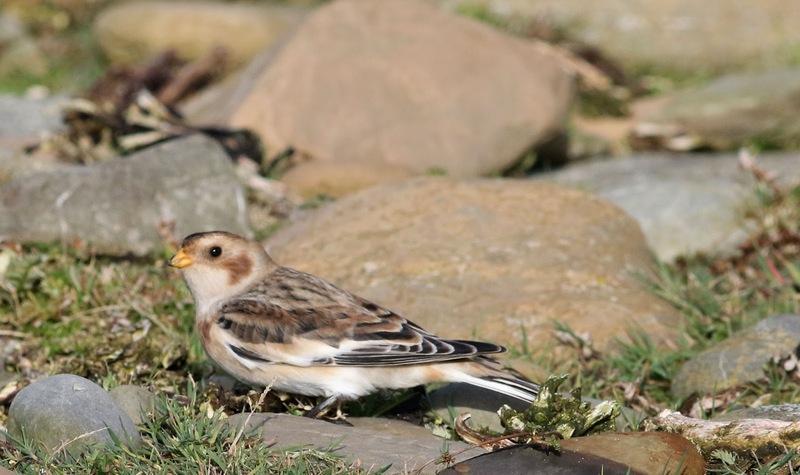 A very confiding Yellow Wagtail was seen around Brides on the 24th and the day wasn't done with that, it was Kirbest again that provided the bird, a Spotted Crake was flushed before dissappearing back into the iris bed. Both Long-eared and Short-eared Owls have been present on the 23rd and 24th respectivly, the Long-eared is the first this autumn. The 20th saw the birding service resume at it's normal pace, but a very busy couple of days meant slightly less coverage than we'd of liked. A single Whooper Swan has been hanging around Ancum and 5 Pink-footed Geese were also present on the 20th. Duck numbers have remained steady with 159 Wigeon, 6 Gadwall, 106 Teal, 28 Mallard, 5 Pintail, 23 Shoveler, 5 Tufted Duck, 3 Long-tailed Ducks and 5 Red-breasted Merganser being the high counts, the big surprise came in the shape of 7 Greater Scaup heading out South past Gretchen early on the 22nd. A single Grey Wagtail was seen on the 20th along with 2 Dunnock, 40 Robin, 1 Whinchat, 7 Blackcap, 16 Chiffchaff, 2 Siberian type Chiffchaffs, 5 Goldcrest, 4 Brambling, another Yellowhammer, a late Willow Warbler on the 21st and a single Chaffinch on the 20th. A total of 6 Red-throated Divers were present on the 21st and the 22nd bought in 3 Woodcock, 2 Guillemot and Mistle Thrush. The bird of the period was a Dusky Warbler found at Westness in the late afternoon on the 22nd, the bird was initially seen flying away and ticking, it was then oggled by all the obs staff a guests before being left to it's own devices. It's busy here at the moment so apologies for the lateness of these blog posts, it's Harvest home time up here so it's all hands to the deck! The winds have stayed East and weather clear. The Female Common Scoter was present again this time on the sea behind Gretchen, the Skylark numbers are still high with total numbers reaching 294. Robin numbers fell too 62 as did Blackcap to 17, Chiffchaff 30, Goldcrest 50, Brambling 52 and Chaffinch 3. The Thrush numbers also decreased with high totals being Blackbird 100, Fieldfare 165, Song Thrush 85 and 263 Redwing rounded off the totals in that department. 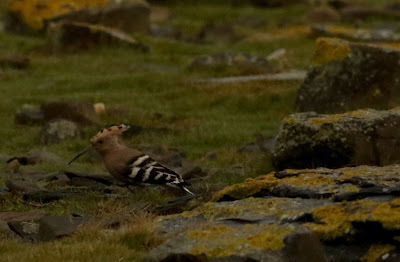 The Hoopoe was still present on the 17th as was the Little Bunting around the obs, another Red-breasted Flycatcher was a nice surprise on the 17th and the bird continued to show well on the 18th. 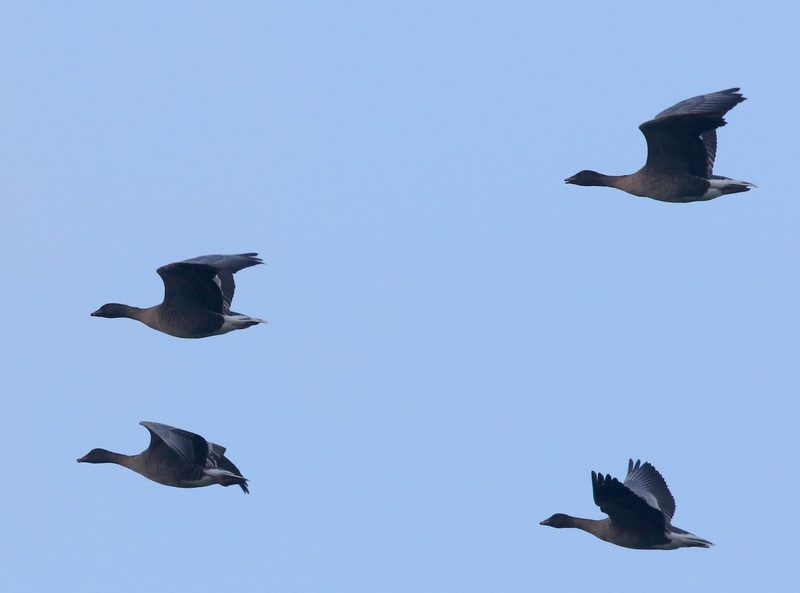 A group of 9 Tundra or Rossicus Bean Geese were found in the field next to Kirbest farm. 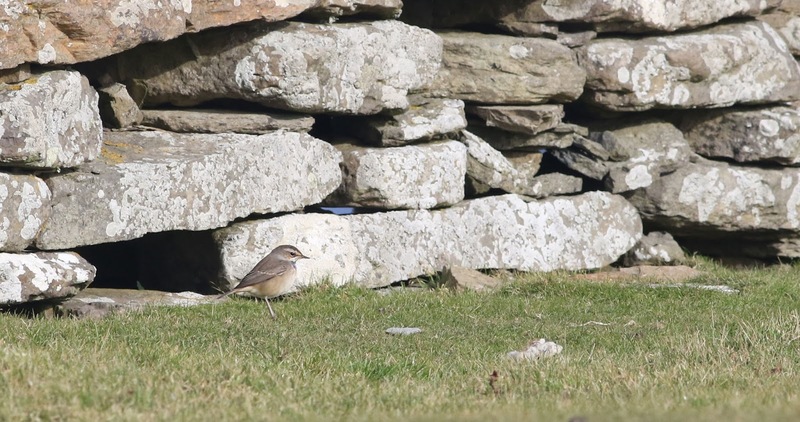 The 19th was a bit of a write off on here, the team decided a successful twitch for the Western Orphean Warbler on mainland Orkney was on the cards. On return the nets were opened, a male Sparrowhawk was trapped and the Hoopoe decided to roost in Holland in the evening, but by a stroke of poor fortune (on our part) it managed to evade the mist nets! The weather has stayed the same and the wind has stayed into the East and it's bought a few birds in. Strong winds grounded large numbers of Gulls on the Links and near Bewan, 360 Great-black backed Gulls and 137 Herring Gulls were the highest counts for both species. Geese numbers have fluctuated with up to 43 Barnacle Geese and 21 Pink-footed Geese present along with large numbers of Greylags. Duck numbers have again stayed around the same figures the maximum totals were 177 Teal, 284 Wigeon, 65 Mallard, 9 Gadwall, 18 Shoveler, 3 Pintail, 2 Long-tailed Ducks, 6 Tufted Duck, other ducks were slightly more surprising, our first Goldeneye of the Autumn was present on Hooking and a single female Common Scoter was on Bewan on the 16th. The pair of ringtail Hen Harriers were still present on the 15th as was a single Kestrel. 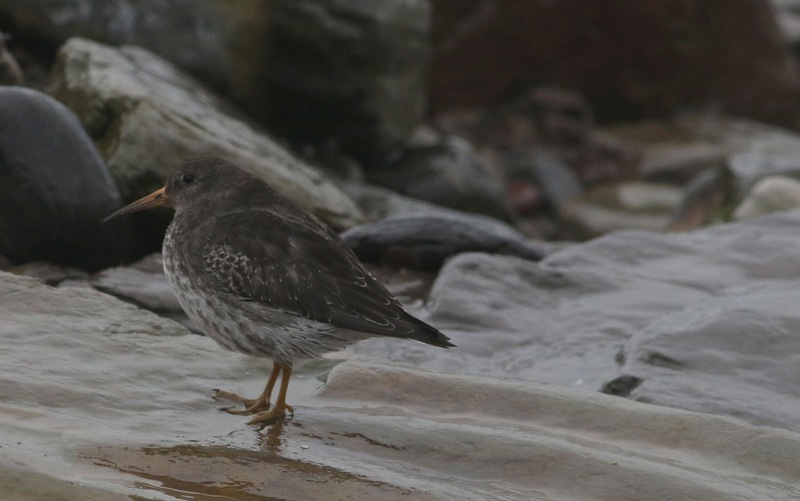 Purple Sandpipers have begun to return back to the island with 16 recorded on the 15th and 14 recorded on the 16th other wader highlights were 4 Jack Snipe and a Curlew Sandpiper at Bewan. 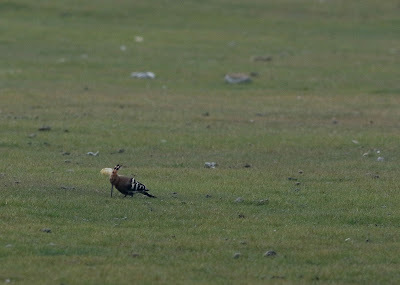 The high counts of Woodcock peaked at 21 birds, 2 Short-eared Owls were present both days and there were 8 Woodpigeon on the 16th. Skylarks have been moving South in large numbers with the max count at 341 birds on the 16th, based on the flocks coming in off the sea the number of birds moving through the island would of been far higher. 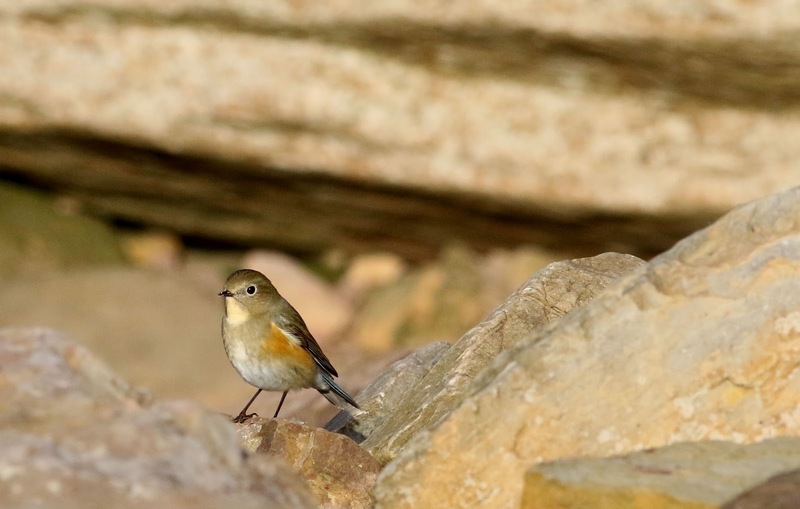 Other passerine high counts were, 105 Robins, 2 Black Redstarts, 1 Redstart, 1 Whinchat, 1 Garden Warbler, 49 Blackcap, 1 Yellow-browed Warbler, 67 Chiffchaff, 85 Goldcrest, 5 Chaffinch, 92 Brambling, 15 Redpoll sp. 25 Mealy Redpoll, 1 Common Rosefinch, singles of Greenfinch and Goldfinch, 1 Crossbill in the surgery garden. 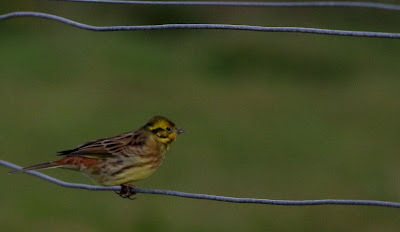 A Little Bunting was present around the obs on the both days, while the Barred Warbler was at Ires Taing again on the 15th, the Hoopoe stuck around Trolla and a lovely adult Yellowhammer was present in the Vincoin tattie patch and the Red-flanked Bluetail was re-trapped in Holland on the 16th. 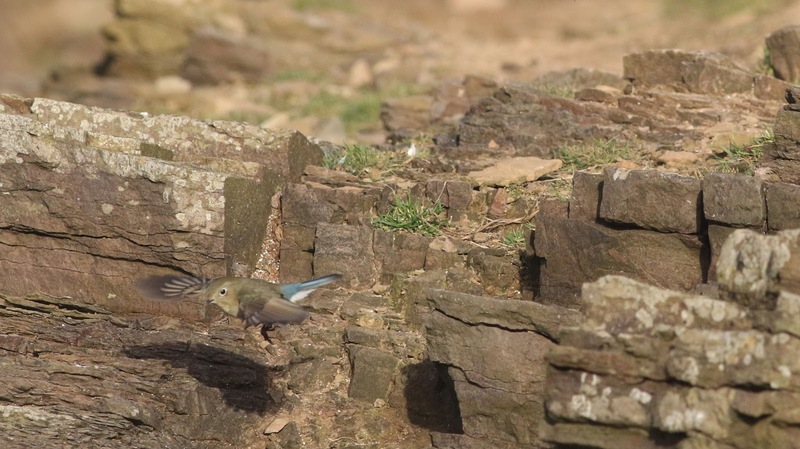 It's been another couple of busy days bird wise and the winds finally gave us a couple of birds to shout about again, one them was a bit of surprise, but we'll get on to that a bit later in the blog post! 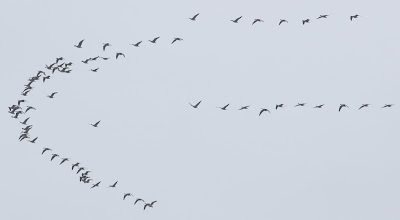 Pink-footed Geese were present again for the first time in a couple days with 26 on the 13th and 29 on the 14th. Other wildfowl was much the same as it has been in recent weeks, 178 Wigeon, 4 Gadwall, 116 Teal, 56 Mallard, 23 Shoveler, 5 Tufted Duck and 1 Long-tailed Duck. 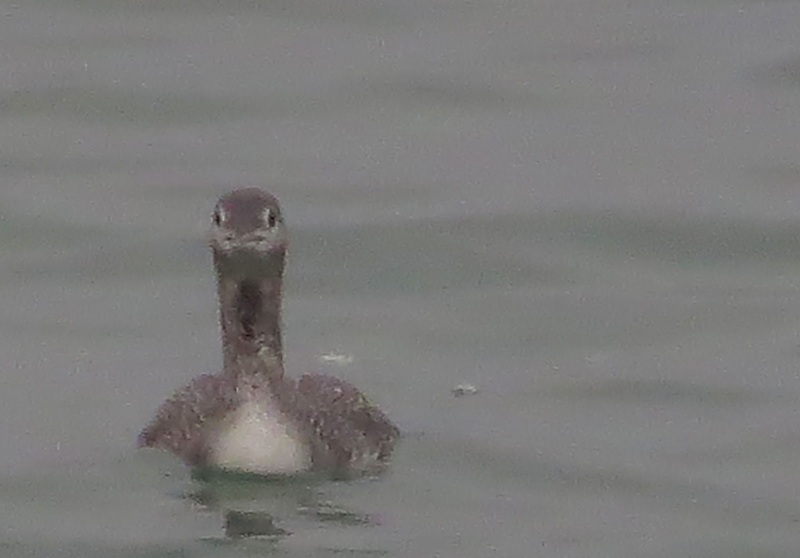 A sea-watch provided little with 3 Sooty Shearwaters being the highlight. The usual birds of prey were present a pair of Hen Harrier and singles of Peregrine and Merlin. Woodcock numbers grew over the two days with 11 recorded on the 13th and 17 on the 14th. Our first Glaucous Gull of the autumn was on links in the morning on the 14th, I'm sure it won't be the last this autumn, Woodpigeon were present on both days and one of the two Richard's Pipits was present on the 13th in the Kirbest thistle field. 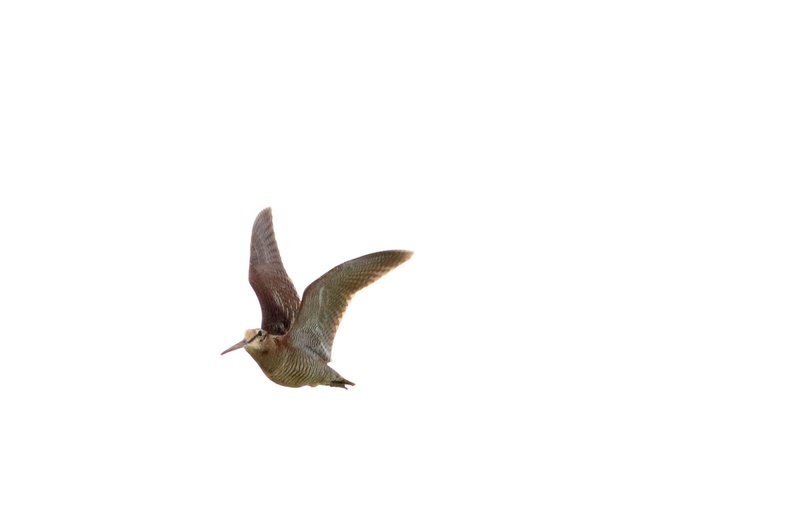 A huge increase in Skylark numbers saw flocks of 30's and 40's in off the sea at Westness and Nether Linnay with the day total finishing on 118. Other passerine numbers were 1 Dunnock, 2 Redstarts, 38 Robins, 25 Blackcap, 1 Yellow-browed Warbler, 30 Chiffchaff, 69 Golcrest, 15 Chaffinch, 20 Brambling, 3 Goldfinch, 6 Common Redpoll, 7 Redpoll sp. and a big surprise was a Norweigan controlled Hawfinch, we're not sure how many have been recorded in the UK but it can't be many! The Thrushes have been pouring in and the numbers have been good, 120 Fieldfare, 89 Song Thrushes, 362 Redwing, 88 Blackbird and a single Mistle Thrush. 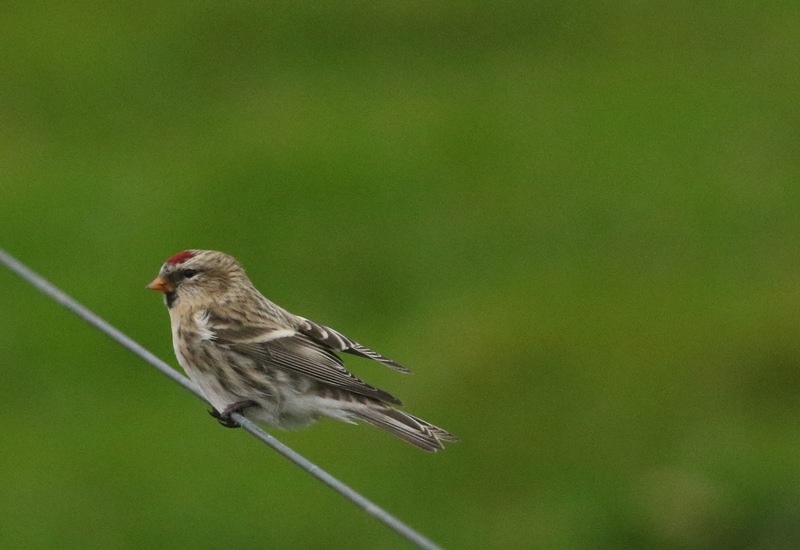 An Arctic type Redpoll was present at Veracott, the bird didn't hang about long and couldn't be located in strong winds. 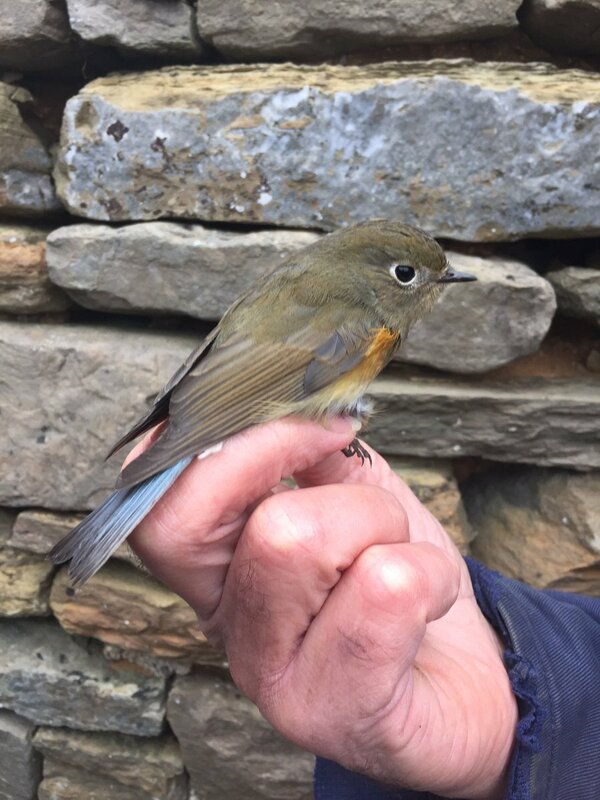 A second Red-flanked Bluetail of the year was trapped in the morning and released in Holland was a nice surprise and an even bigger surprise on the 14th was a Hoopoe originally found at Ires Taing and then re-located at Trolla Vatn were it showed well for all spectators. The Easterlies continued and set to do so for a while, so we're making the most of it and hoping for megas. Wildfowl numbers have stagnated a little the highest totals over the two days were 153 Wigeon and 35 Mallard on the 12th, majority of the numbers came from the 11th with 5 Gadwall, 181 Teal, 2 Pintail, 5 Tufted Duck, 38 Shoveler and 2 Long-tailed Ducks. 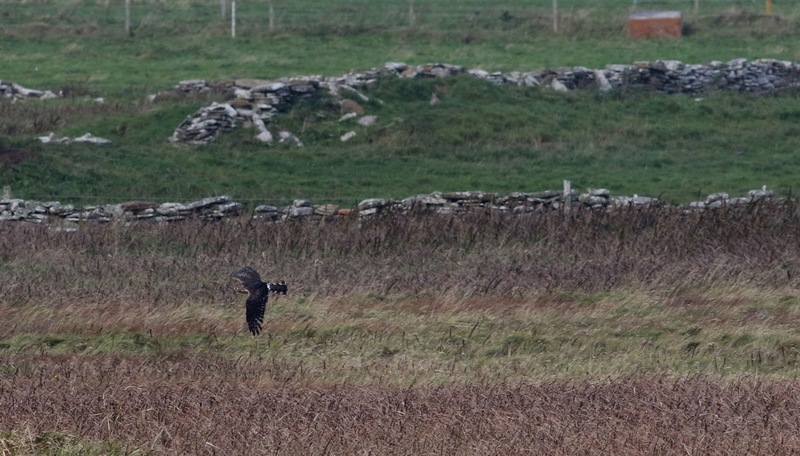 Two Ringtail Hen Harriers have been present on island for a little while now and continued to tour the island. 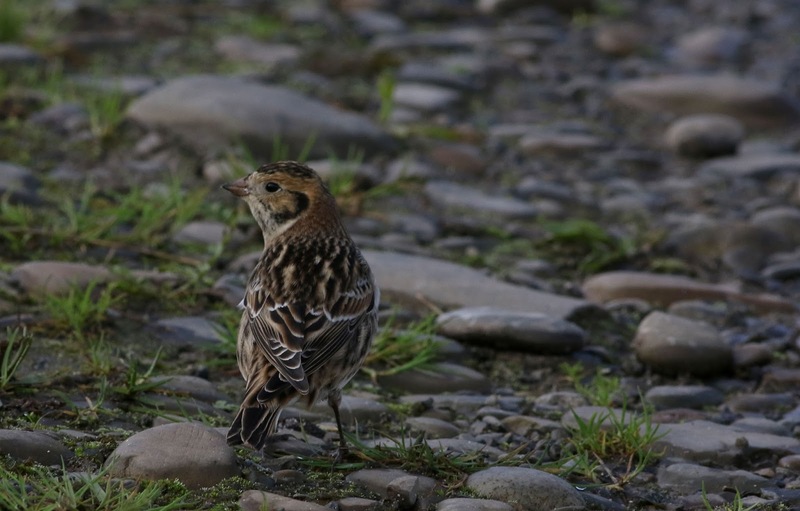 Singles of Woodcock were recorded both days, 320 Snipe were accompanied by 7 Jack Snipe and a sea-watch provided what will be one of last Puffins this year. Passerine numbers are still good and the highest totals for the two days are as follows 6 Robin, 2 Dunnock, 286 Meadow Pipit, 1 male Redstart at Snetten, the single staying Whinchat was still present, 1 Lesser Whitethroat, 1 Mistle Thrush, 10 Blackcap, 20 Chiffchaff, 52 Goldcrests were still kept company by the Firecrest, 17 Chaffinch, 3 Brambling, 1 Goldfinch, 12 Redpoll sp. and 3 Mealy Redpoll. 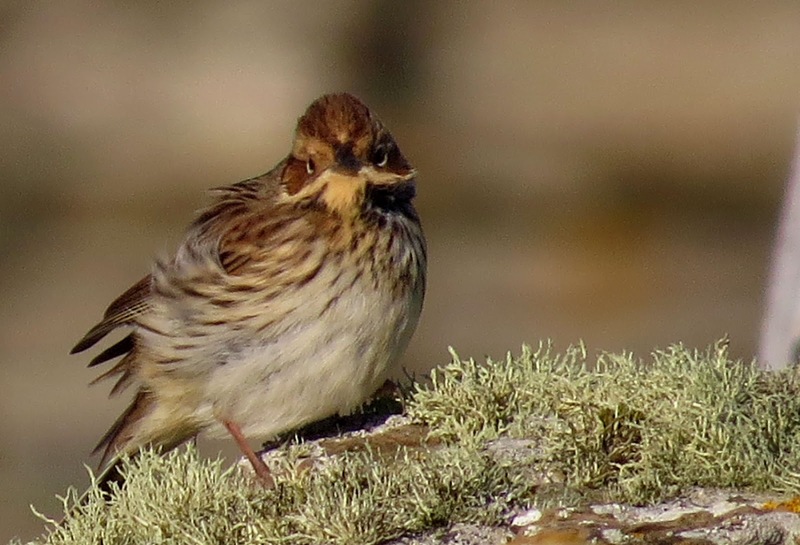 The Little Bunting numbers are holding steady at 3 birds still in East Loch Park and they were accompanied by a pair of Richard's Pipits feeding between East Loch Park and the Kirbest Thistle field. Another decent couple of days of weather and birding, 8 Red-throated Divers has been our highest count for a few weeks, while Pink-footed Goose numbers continue to fall with 58 being present on the 10th. 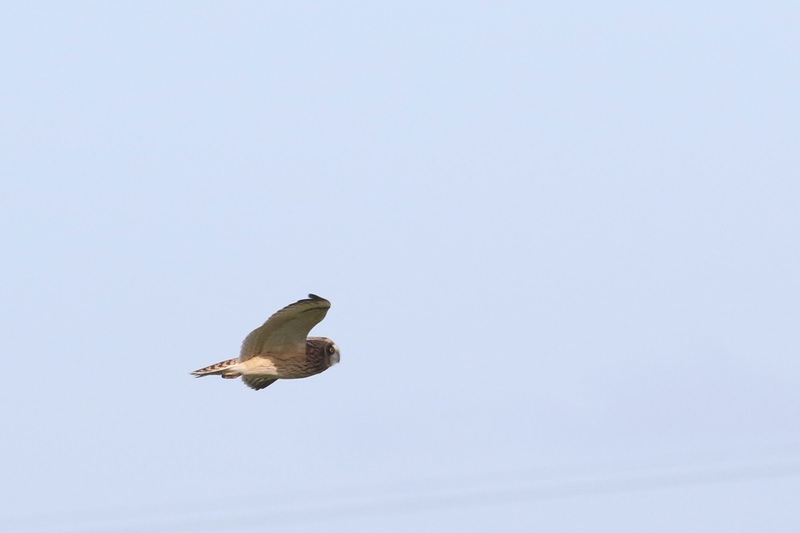 A pair of Hen Harriers were present on both days, a female Sparrowhawk was trapped in Holland on the 9th and 3 Merlin were also present on the 10th. Woodcock have started to return, with 3 being our highest count this Autumn, the Grey Phalarope was still present on the 9th but hasn't been seen since. 4 Purple Sandpipers and a single Curlew Sandpiper on the 9th were the other wader highlights. Thrush numbers are still on the rise, 9 Fieldfare and 44 Redwing were maximum counts on the 10th and Song Thrushes peaked the previous day with 15 recorded. 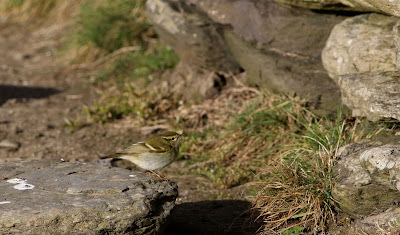 Other passerines included 3 Yellow-browed Warblers on the 9th and 2 on the 10th, 14 Blackcaps, 21 Chiffchaff, 79 Goldcrests, 8 Chiffchaffs, 5 Brambling, 22 Wheatear, 7 Goldfinch, 1 Lesser Whitethroat, singles of Black and Common Redstart and 64 Twite. 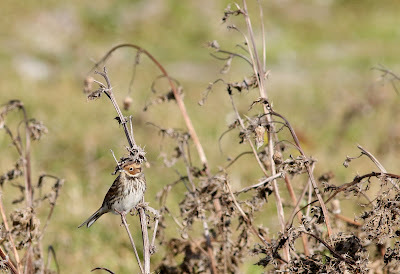 The good numbers of Little Buntings continued with no less than 5 birds being recorded around the island. 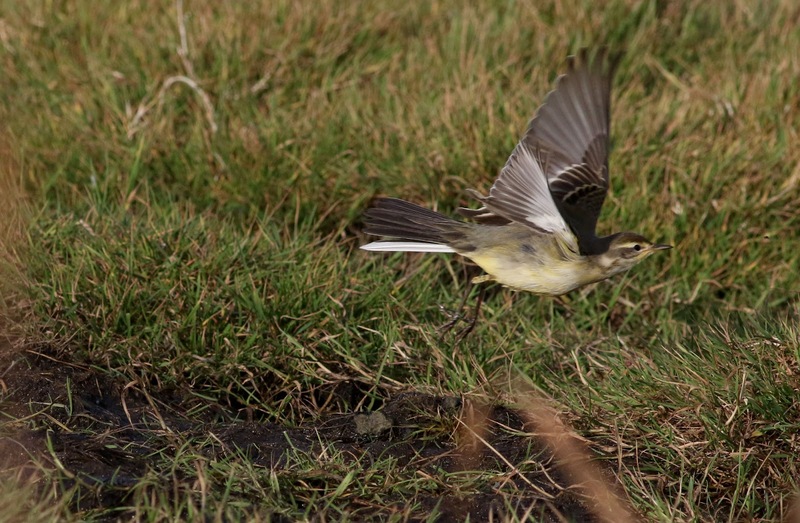 It's been really good couple of days on here with migrants coming in and plenty of birders to find them. Thrush numbers have began to rise and showed their highest totals on the 8th, 98 Redwing, 41 Song Thrush, 10 Fieldfare and 2 Mistle Thrushes on the 7th. 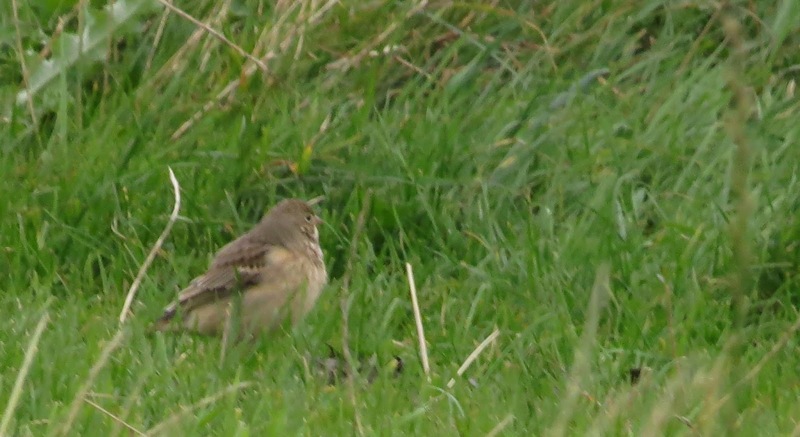 Meadow Pipit numbers rose to 401 on the 8th and Rock Pipit numbers peaked at 15 on the 7th. Wildfowl is always a big part of proceedings this time of year and numbers have been growing, 2 Whooper Swans were present around the island on the 8th, while Teal and Wigeon numbers rose to 213 and 148 respectivly, meanwhile there were 4 Gadwall, 31 Mallard, 19 Shoveler and 4 Tufted Ducks to round things off. A surprise redhead Goosander on the 7th, flew up Linklet Bay but despite further searching wasn't re-located, another bird that avoided re-location was a 1st Winter Dotterel seen briefly near the Old Kirk before flying with Golden Plover never to be seen again! Grey Plovers were present both days as was the lingering Grey Phalarope on Gretchen, other waders of interest were 5 Jack Snipe, 1 Ruff, 2 Knot, 5 Woodcock and a Greenshank. 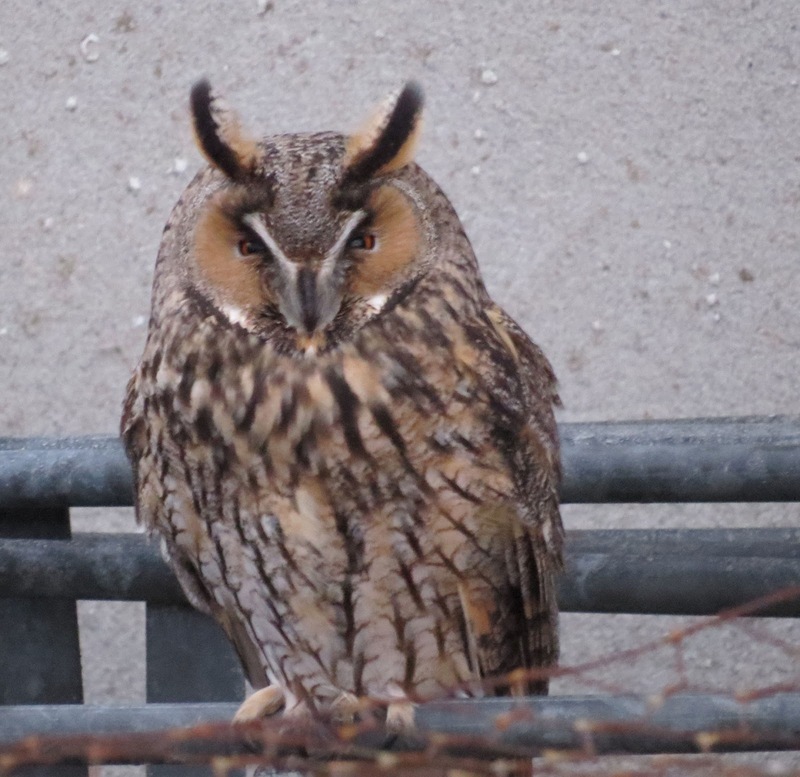 Short-eared Owls are always a nice bird to have around and 2 were present on both days in various locations. Goldcrest started to influx onto the island the 8th saw 92 recorded but this was dwarfed by the previous day that saw 148 recorded, there were probably more than that on the island but we have to be conservative in our counting! 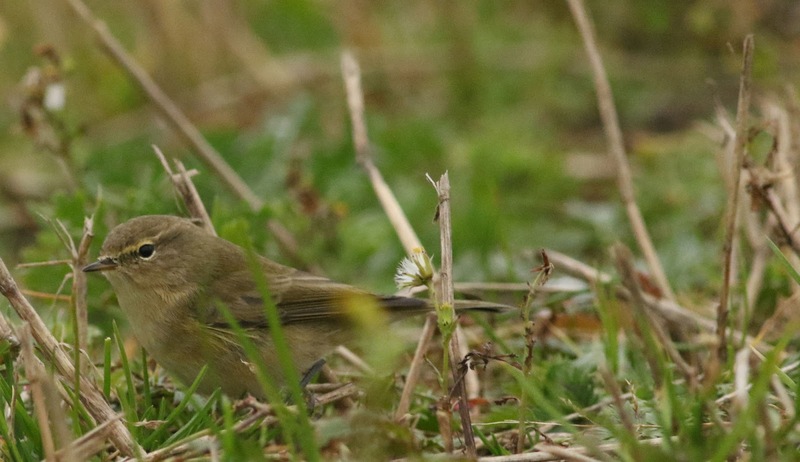 Passerine numbers in general were good over the two day period the highest counts were 15 Chiffchaff, 2 Lesser Whitethroats, 22 Blackcap, 12 Yellow-browed Warblers, the Firecrest was still in Holland and our third Red-breasted Flycatcher of the year was trapped in Holland. 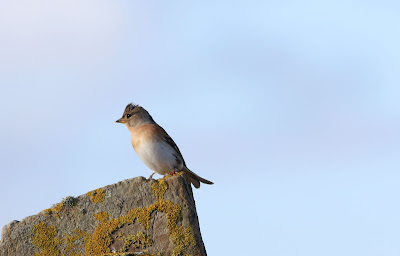 We've had so many different Buntings and Finches it's only fitting they're get there own section in this blog post, the saw the highest totals posted for Chaffinch and Brambling coming in at 12 and 14 while the 8th saw a Hawfinch trapped at Holland, a single Rosefinch, 48 Snow Buntings, the Ortolan Bunting back at Kirbest and 5 Little Bunting were present on both days. We predicted the big rare in the previous post and 7th bought us exactly what we'd been craving, Sam managed to stumble across a stunning Red-flanked Bluetail on the Lenswick footpath, the bird showed superbly for all spectators and provided that bit of magic we'd all been waiting for! The last couple of days have been a bit frustrating to say the least, with plenty of birds on the East coast the general feeling was that we'd missed out on the pickings of the good birds before things picked up on the 6th with a little flurry of scarcer migrants, we're still missing that biggy but we feel it's just around the corner! Passerine highlights were 26 Blackcap on the 6th, along with 9 Yellow-browed Warblers, 13 Chiffchaff, 1 Willow Warbler, 68 Goldcrest, 9 Chaffinch, 24 Brambling, singles of Common Rosefich and Goldfinch, 61 Snow Buntings and the Firecrest reamined in Holland over the two days. The 5th was quiter passerine wise only providing 9 Robin and a Lesser Whitethroat as it's higher totals. Wildfowl continued its flow South, 148 Barnacle Geese saw a slight stemming to the flow of the previous days, as did the 96 Pink-footed Geese, the 6th saw that flow decrease further, with even less moving, however 4 Whooper Swans on the 5th were a bit of a surprise. Otherwise Wildfowl numbers would climb to 252 Wigeon and 341 Teal, even the Long-tailed Duck on Brides gained a friend! A blogworthy count of 288 Great Black-backed Gulls showed signs of our first weather driven birds this autumn, they didn't contain a customary white winger but it's perhaps a little early yet! 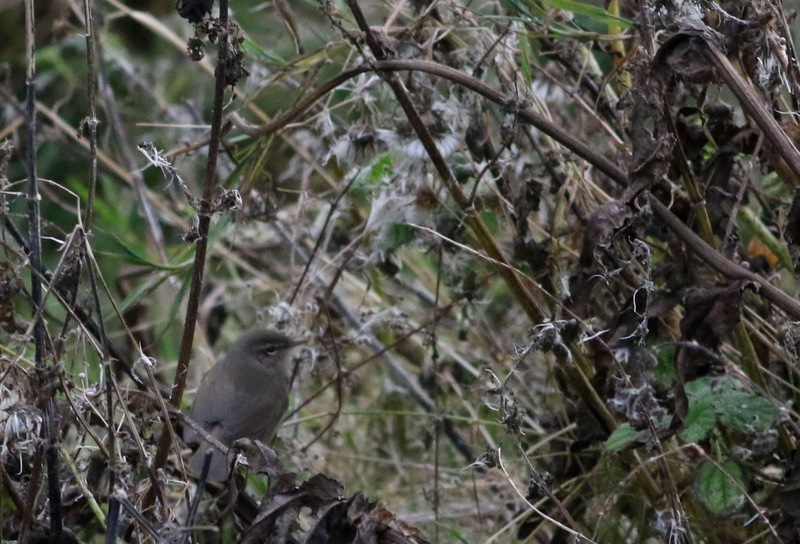 Other noteables included more Thrushes, 44 Blackbirds, 47 Song Thrush, 13 Fieldfare, 75 Redwing and single Mistle Thrush gave the island a distictly autumanal feel. 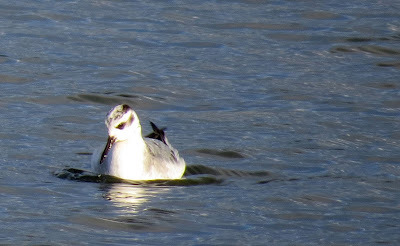 Waders pushed the numbers up, singles of Ruff and Curlew Sandpiper were present on both dates, as was the Grey Phalarope on Gretchen, a second Phal was seen off of Brides on the 5th. Snipe and Jack Snipe numbers are also on the climb, with 405 and 9 being counted respectivly. Right, into the good stuff! 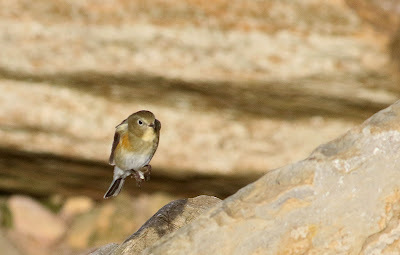 A whopping 6 Little Buntings in various locations, bought that little something we'd been missing as did our 2nd Ortolan Bunting of the autumn at Kirbest, it was less brief than the first with multiple observers seeing it, but they're not very obliging! 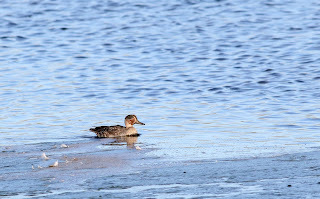 A couple more days of almost constant wind and clear weather made for slim pickings on the birding side of things. Sea-watches over the two days provided maximum highlight counts of 46 Sooty Shearwaters, 6 Manx Shearwaters and 13 Little Auk. Our first real movement of Barnacle Geese came on the 4th with 153 being seen in various flocks throughout the day, the start of the Barnies has seen a stem in the flow of Pink-footed Geese, with 105 being our highest count for the period. 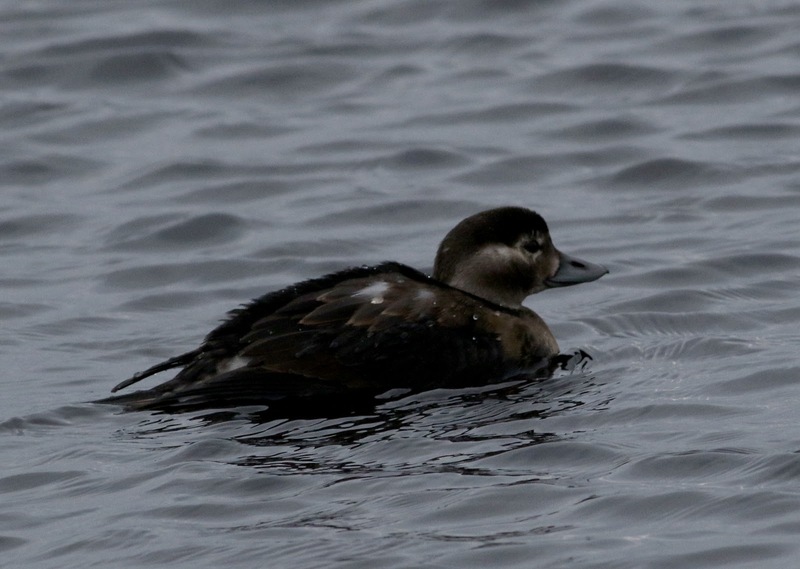 The female Long-tailed Duck was present again and remained for the two days, the 4th saw a build up in Wigeon and Teal numbers, with 270 and 282 being counted respectivly. The other obvious build up has been Thrush numbers, it's not quite as dramatic as in previous years but the trickles have turned into small gatherings peaking on the 4th, 7 Fieldfare, 37 Song Thrush and 47 Redwing being the highlights. A trio of Merlins have been present both days as have a pair of Peregrines other birds of prey included 2 Short-eared Owls also on the 4th. Wader movement has been a bit slow for our liking, but things could always be worse! 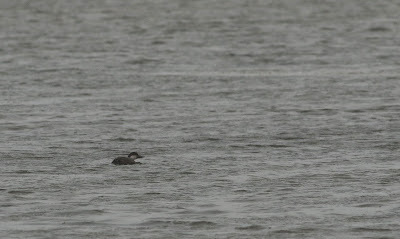 2 Curlew Sandpipers, 13 Jack Snipe, 6 Grey Plover and the ever present Grey Phalarope was still on Gretchen both days. One of couple of surprises was a Little Egret seen briefly on the 4th flying North, with the bird being the 2nd island record it left a few of us gutted to not catch up with it, but that's how it goes! 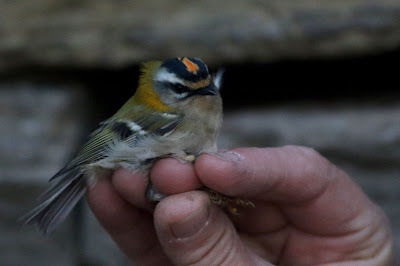 Another surprise and bird of the period was a lovely male Firecrest in Holland, only our 8th island record and offering a glimmer of hope for something a little better after a frustrating couple of days. Other passerines news was usual fodder, 1 Lesser Whitethroat, 6 Blackcap, 9 Chiffchaff, 1 Common Whitethroat, 2 Whinchat, a single Redstart and Tree Pipit, 20 Rock Pipit, 4 Brambling, 2 Robins, a Common Redpoll trapped on the 3rd and 11 Yellow-browed Warblers. Last but not least a Bluethroat was found in the Quoy of Longar at lunchtime on the 3rd, it's our 6th this year and first of the autumn. 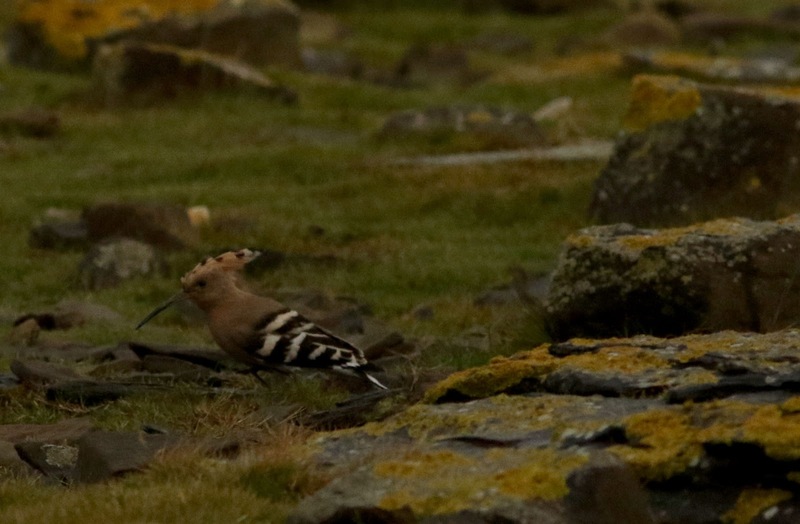 The winds have gone Easterly but the birds are yet to arrive! Despite this the 1st was a very busy day in the guest house and in the field. 17 Red-throated and 3 Great Nothern Diver hid from the prevailing winds in various locations and duck numbers built again, with 151 Wigeon, 7 Gadwall, 319 Teal, 72 Mallard, 28 Shoveler, 35 Tufted Ducks, 1 Pintail and our first Long-tailed Duck of the autumn was present on Brides. 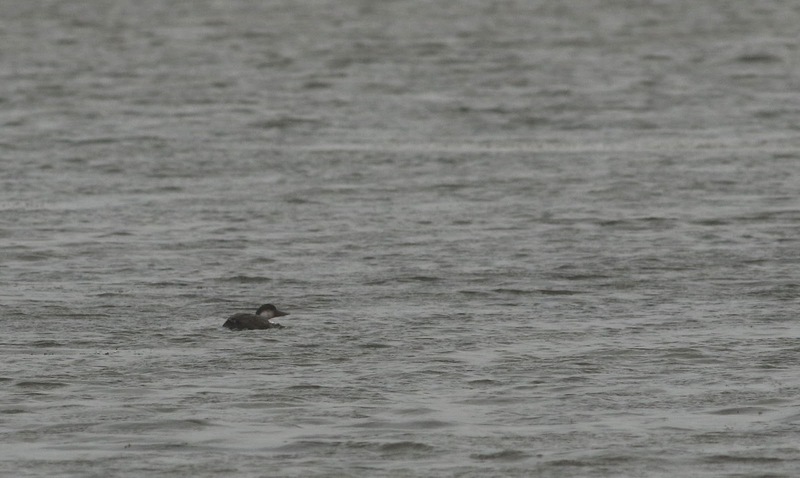 The Slavonian Grebe was still present this time viewable off the pier. Snipe numbers peaked at an impressive 475 followed up by 5 Jack Snipe. Other wader numbers included 6 Grey Plovers on the 2nd, 4 Curlew Sandpipers present on both days, 15 Purple Sandpipers, 24 Bar-tailed Godwits and the lingering Grey Phalarope was still present. 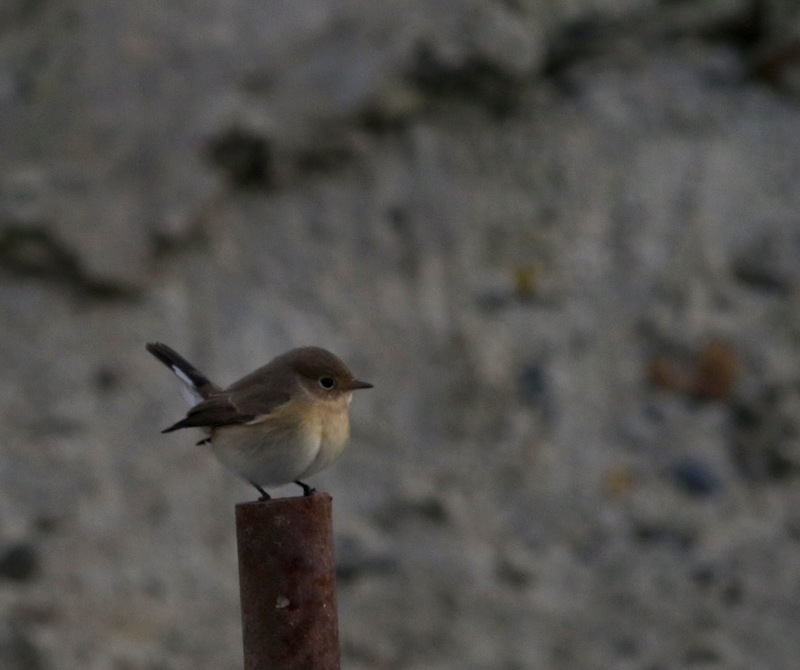 Passerine numbers over the two days peaked as follows, 1 House Martin at Holland, 5 Blackcap, 4 Whinchat on the 1st, singles of Robin, Dunnock and Tree Pipit, 33 Redwing, 5 Lesser Whitethroat, 2 Garden Warbler, 13 Chiffchaff, 3 Willow Warbler, 7 Goldcrest on the 2nd, 3 Brambling, our first Greenfinches of the year with 3 being seen in various locations, 4 Goldfinches, 28 Twite, 57 Lapland Buntings, 19 Snow Buntings, 15 Rock Pipits and a whopping 51 Yellow-browed Warblers. A Sea-watch on the 2nd provided 44 Sooty Shearwaters, 5 Manx Shearwaters, 4 Little Auks and 15 Puffin. Last but by no means least for the second year running we were treated to a Humpback Whale that moved up the Firth and up the West Side before dissappearing, it seems they may becoming a more regular site in our waters, it was accompained by 8 Risso's off Linklet bay. 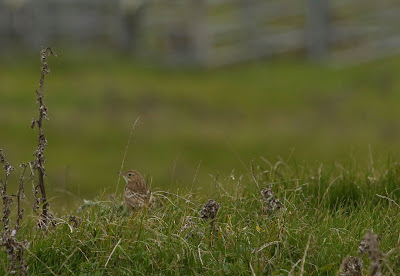 Another couple of days of poor weather saw an ever so slight change in fortunes with a little more turning up but nothing too much to shout about. Whooper Swan numbers grew to 43 birds, one of which was a colour ringed bird, originally ringed in Iceland earlier this year. Pink-footed Geese numbers fell to 1278, however within the reduced Pinkie numbers was our first Barnacle Goose of the Autumn. A sea-watch produced a single Arctic Skua, 18 Sooty Shearwaters, 1 Arctic Tern, 1 Comic Tern, 2 of 4 Red-breasted Mergansers and another first for the autumn came in the shape of 6 Little Auks. Passerine wise things have been a bit slow and this didn't change, a Tree Pipit was present at Senness, there were also 1 Willow Warbler, 2 Blackcap, 2 Chiffchaffs, 1 Goldcrest, 13 Lapland Buntings, 1 Song Thrush, 8 Snow Buntings, 2 Chaffinch, 38 Skylark on visible migration and 1 Yellow-browed Warbler. It was a similar story for the waders with one Grey Plover, 12 Purple Sandpipers, 5 Ruff, 2 Jack Snipe and a Little Stint. The big surprise of the day were 2 Grey Phalaropes, one on sea-watch and one on Gretchen were our 2nd and 3rd of the year. Other birds to note were 6 Red-throated and 1 Great-Northern Diver and a Collared Dove at Holland. The 30th was a much quieter day all in all, Teal numbers rose 295 and a pair of Pintail were on the island, the Juvenile Hen Harrier was still at Brides and Grey Plover numbers went from 1 to 7. One of the two Grey Phalaropes was still present on Gretchen. Another sea-watch produced another 6 Little Auks, 4 Sooty Shearwaters and 1 Manx Shearwater. 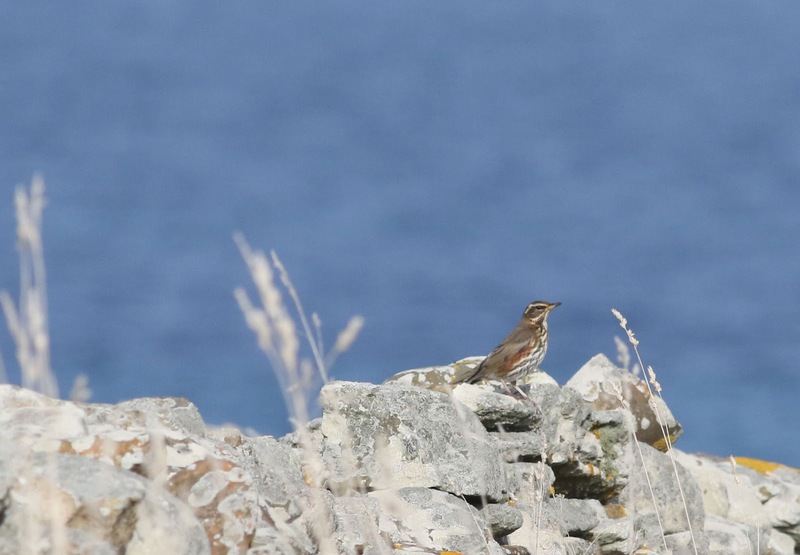 Our first Redwing of the Autumn was seen flying around the obs in the morning, other passerines of interest were 1 Yellow-browed Warbler, 2 Chiffchaffs, 1 Goldcrest, 1 Whinchat, 5 Swallow, 1 House Martin and 48 Skylark. Waders again didn't show much in the way of movement, with 367 Snipe, 11 Bar-tailed Godwits, 1 Black-tailed Godwit, 1065 Golden Plover and a pair of Curlew Sandpipers. The wind really picked up over the period and the 27th was almost unbirdable, all bar the movement of Pink-footed Geese with over 2000 being recorded on both days, singles of Jack Snipe, Ruff, Bar-tailed Godwit, Whinchat, Song Thrush, Garden Warbler and Lapland Bunting rounded the 27th off with very little to shout about. The 28th was a very different story a moulting adult Slavonian Grebe was seen briefly off the links in the afternoon, another first for the autumn was a Goldfinch at Senness. 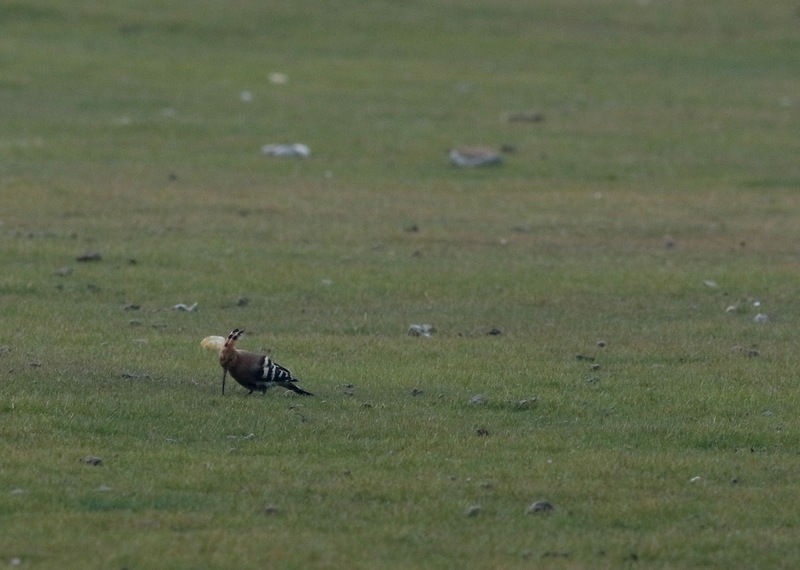 The golf course also played host to 7 Snow Buntings and a single Kestrel. Good numbers of Merlin were recorded with 4 individuals being present, wader numbers remained pretty much as they were, 3 Grey Plover, 2 Ruff, 4 Jack Snipe, 16 Bar-tailed Godwits and 476 Snipe being the highlights. 23 Woodpigeon were seen flying North-West over Holland, which is a record count breaking the previous record of 22 set in 1998. Other highlights include 4 Whinchat, 1 Garden Warbler, 6 Blackcap, 4 Chiffchaff, 1 Willow Warbler, 3 Goldcrests, 28 Lapland Buntings and 2 Yellow-browed Warblers. 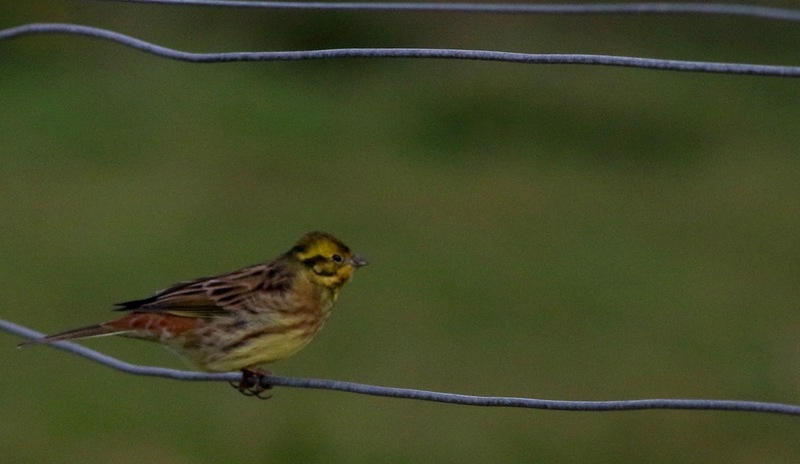 The big highlight of the day was an Ortolan Bunting that stopped briefly at the Kirbest crop.